Are you looking for a beach day in Valencia without going far? You'll find just what you've been looking for at Valencia's beautiful city beaches: La Malvarrosa and Las Arenas. La Malvarrosa is almost two kilometres in length, while Las Arenas is 1200 metres. If you want something more than lounging on the beach, you'll be glad to know that there is no shortage of activities surrounding these Mediterranean playas. More on what you should check out below. La Malvarrosa and Las Arenas border the southern part of Valencia, beginning at the port. From Puerto de Valencia, Las Arenas is the first of the two beaches. Although it was originally called Playa de Levante or Playa del Cabañal, it has come to be known as Las Arenas after "Spa Las Arenas", where wealthy families came to take wave baths in the late nineteenth century. Walking north along the beach, you'll eventually come to La Malvarrosa. La Malvarrosa is named after the large number of hollyhocks that covered the beach in past centuries. Today, the two beaches resemble each other so much that it isn't easy to see exactly where one ends and where another begins. Both even share an average width of 60 metres. La Malvarrosa and Las Arenas are much more than a place to tan, swim, and jog. 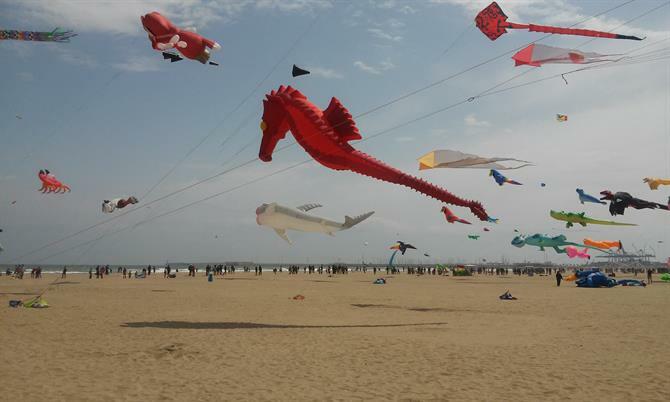 They can be seen hosting numerous events during the year, including the Las Fallas fireworks festival, the international air show, and an international kite festival. In recent years, you could also witness major events from the beaches, such as America's Sailing Cup and the Formula 1 World Cup. The former fishermen's quarters that line La Malvarrosa and Las Arenas give the beaches a special feel. The inhabitants of the area's neighbourhoods of Cabañal, Cañamelar or El Grao have hundreds of stories of the fishermen who cast their nets into the Mediterranean to support their families. The area is presently awaiting a rehabilitation plan to return the glow it once had. Like Las Arenas, La Malvarrosa was also a popular summer spot for wealthy families. These beaches have inspired artists including Impressionist Joaquín Sorolla and novelist Vicente Blasco Ibáñez; it has to be said that the stunning luminosity of Sorolla’s paintings and Ibanez’s detailed descriptions only added to the magic of Valencia that inspires visitors to come from near and far. Along both beaches you can also enjoy a game of beach volleyball at one of the many sand courts. Families like the nearby playgrounds, and the impressive sand sculptures are always a favourite. At present, Valencia is home to Europe's tallest ferris wheel and it has become an integral part of the city. At 70-metres tall, this is one of the best places to take in views of the city and the sun setting after a relaxing beach day. Each cabin has room for eight people, with easy access for wheelchairs. La Malvarrosa and Las Arenas are lined by a wide seaside promenade. As previously mentioned, novelist Vicente Blasco Ibáñez brought Valencia to life in literature. Down the boardwalk from La Malvarrosa, towards the town of Alboraya, is the summer house where he stayed, which has been restored as a museum. Inside, you can see objects and significant memories from the writer’s life. It is an interesting place to visit nearby the beach. Along the boardwalk, there are also stands to buy crafts, jewelry, bathing suits, and multicoloured summer dresses. You'll also find places offering henna and hair braiding. Another section of the promenade is called Paseo de La Mostra de Valencia, which is also the name of the film festival that is held in the city. Look down and you'll see the festival's palm tree symbol and the names of famous national and international actors on the granite slabs. There are tons of restaurants along the promenade, including great places for tapas, ice cream spots, coffee shops, and bars with lively terraces. Among these, two restaurants, La Pepica and La Marcelina, opened in the late nineteenth century and are definitely worth a visit. In the morning, fresh Valencia orange juice is a must. For lunch or dinner try Valencia's most famous local dish, Paella, or the various fresh seafood available everywhere. Mussels, clochinas, are a another typical dish; they are of a smaller variety than in other parts of Spain, but they are absolutely delicious. Finally, get a glass of horchata, also written orxata, for dessert or as a midday treat. You can make use of the seven bus lines that pass through the city. Some lines circulate throughout the year (lines 2, 19, 31 and 32). In the summertime, lines 20, 21 and 22 are added. You can also choose to rent bikes or use the tram (lines 4 or 6), getting you just a few meters away from the beaches.